Hot Water Method – place teabag in pot and cover with 2 cups of filtered water. Bring to a boil. Turn off heat and let steep for 5-10 minutes, preferably with lid on to contain flavor. Add 2 more cups of cold water. Stir in sweetener if desired, pour over ice and enjoy. Cold Infusion Method– place teabag in pitcher or 1 quart container. Fill with 4 cups (1 quart) of filtered water. Let steep all day or overnite in fridge or outside in cool weather. This method takes longer as there is no heat involved. The flavor is not quite as strong but it will yield a technically “raw” tea since the herbs will not be cooked. 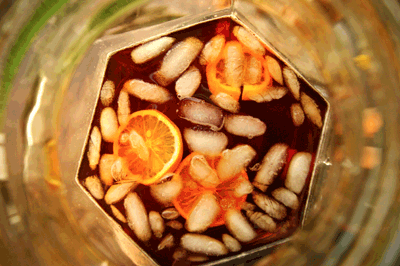 Sun Tea Method– place teabag in pitcher, sun tea container or quart jar. Cover with 1 quart of filtered water. Place in sun until the tea becomes dark in color. Depending on where you live and how hot it gets, this could take 2 hours or 8 hours. Typically 2-4 hours is all you will need. Serve over ice and enjoy. Enjoying Hot – simply pour 1 quart of boiling water over teabag into a teapot, steep for 5-10 minutes and pour into a teacup for a hot cuppa’ tea. It is quite delicious with honey and a spot of cream or milk or by itself. Drinking Soothin’ Infusion hot has helped me to ward off several colds. Mixed Drinks – I have never tried this method myself, but have heard from others that it is quite good mixed with hard liquor of your choice and made into a cocktail. Cooking with Soothin’ Infusion – I have had all kinds of customers write to me and tell me that they cook with my tea. So far I have heard of it used in smoothies, soups and for steaming vegetables. I have tried it in a few dishes and I must say, it is really good. Caffeinated Brew – If you are looking for a stronger brew with a little pick me up, simply add a couple of bags of some black tea to your infusion. Brew the black teabags and Soothin’ Infusion together and you will have the most delicious iced tea you will ever drink. Soothin’ Infusion is also delicious served with lemon, fresh lemon balm and mint leaves. I sometimes add some vanilla extract for an extra flavor infusion. The Original blend is delicious on its own, but is great sweetened with honey, stevia drops, maple sugar, xylitol or palm sugar. The Sweetened blend is already pre-sweetened with just the right amount of pure Stevia leaf (not powder or extract). If you come up with a new way to make or use Soothin’ Infusion, feel free to write to me and let me know.